i was up late last night doing my taxes. once i got caught up in the moment, adding and subtracting and multiplying and dividing numbers, i just couldn't stop. let's just say i owe the federal government "some" money. being a masochist, i then did my state tax as well, just to get it out of the way, just to find out what the total damage would be. let's just say i owe the state "some" money too. i finally went to bed feeling poorer than usual. i woke up to some more bug reports in an e-mail. nothing specific, just that things weren't working. based on that vague information i spent two hours combing through code again, locating a few more bugs. this is what i'm most afraid of, waking up and discovering things are broken and i'm the one to fix them, one minute i'm peacefully asleep, the next i'm in a whirlwind of thinking. with that done, i had some tea eggs for lunch. 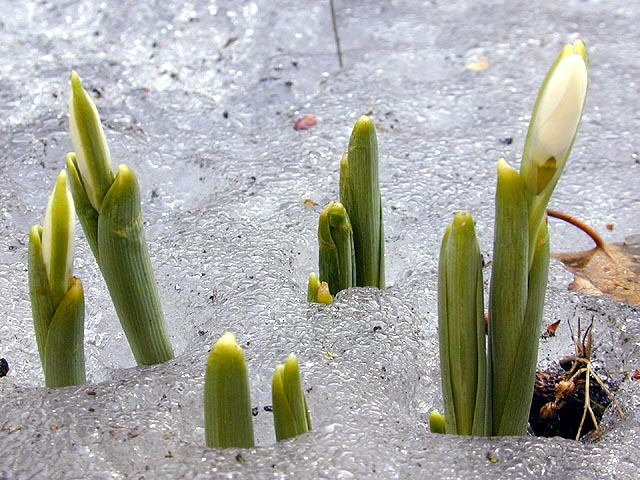 although not as warm as yesterday, the weather today was warm enough to continue melting the snow in the backyard, revealing more and more bulbs poking through the ice. i can't help to think what's going on in my parents' backyard in belmont. 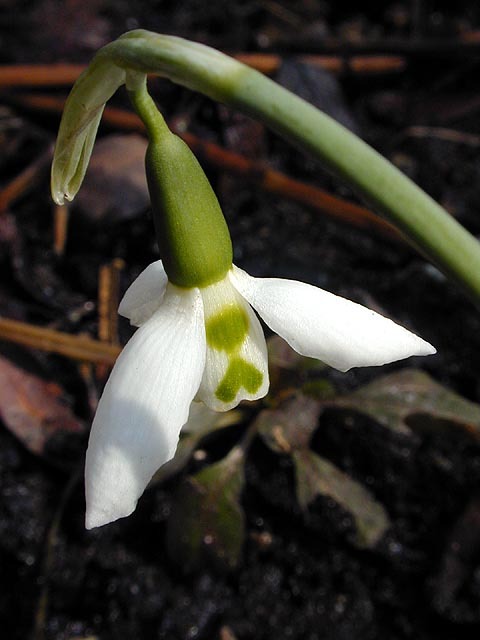 there aren't any snowdrops but there are crocuses i buried many years ago that emerge from the snow late winter. later, the daffodils will come out, as well as the hyacinths. my sister dropped by briefly to deliver a side table she had bought and bag of my mail. i put the table next to the doorway in the living room, some place to put my keys and change and mail. i refigured my taxes using different numbers. after playing around with it, i think i might be able to save about $100-200, but that's nothing compared to the overall amount i owe the government. i was supposed to get money back because i can deduct the interest i pay on my mortgage which is a huge chunk of change, but because i went on unemployment for the second half of last year and didn't go with the automatic deduction program, i ended up owing more taxes than i was going to get in return. now that my income taxes are done, i'm going to sit on them until the very last minute, as if doing that will magically incubate greater tax savings. at the very least i'd like to run the numbers through a software. i've used a taxing program for the past three years, but this year, in order to save money, i did it by hand, which wasn't very hard, but i'm worried i might've done it wrong. not that i think i owe the IRS even more money than i already do. later in the evening alex wong dropped by unexpectedly. he hung out for a few minutes, we briefly talked about when i could get his car when he leaves for japan after this weekend, and whether or not he wanted to borrow my ibook to store his digital photos. he used the bathroom, then left to find dinner. i had a portion of lasagna heating in the toaster oven that i ate while watching the 2nd installment of children of dune on the scifi channel. later, i watched the conclusion. it was a good 6 hours, but after watching it all, i'm still scratching my head. i need some dune cliff notes.